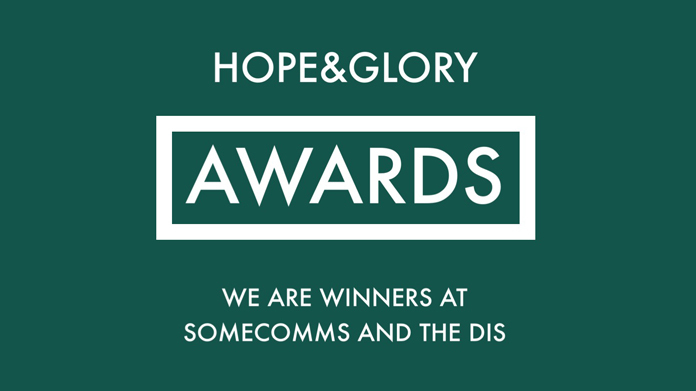 As most of the readers of this site will know, Hope&Glory is only new. We’re a year old in November, as it happens. We opened our doors officially for the first time on 23 November 2011. So we’re really chuffed that, in our first year, we’ve already bagged our first award. Actually, after this week, our first three. First of all, on Tuesday, we glad-ragged ourselves up and trundled off to the Digital Impact Awards – with low expectations but reasonably high hopes. As it turned out, the latter were rewarded as we bagged a Highly Commended in the Best Use of Video category and then got the main prize taking home a Gold in the Best Social Media Campaign in Tech, Telecomms and Media category for our work with O2. Then, on Thursday, we once again donned our finery and headed north for the Some Comms Awards. Against competition from Neoco, Pretty Green and Online Fire, amongst others we took home the award for Best Use of Twitter and then, totally unexpectedly, we were also rewarded with the Best Small Agency award. Which was bloody remarkable to be honest.